← a spicy spin through the park? 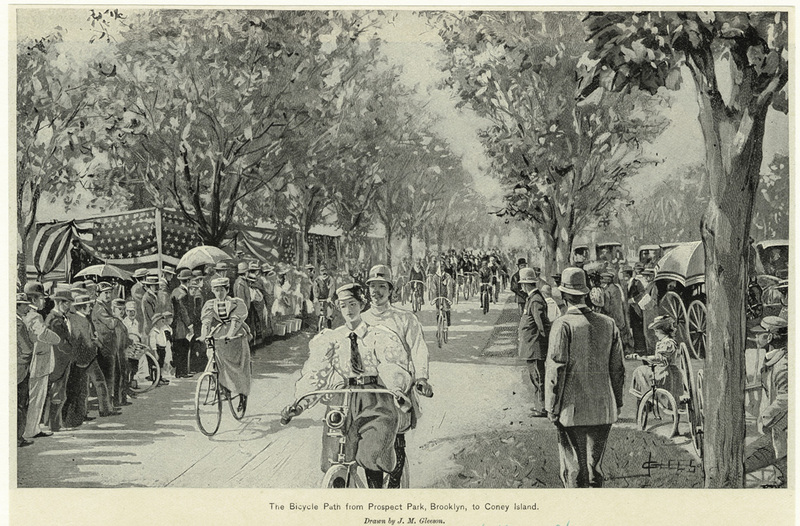 This illustration shows the bicycle path from Prospect Park, Brooklyn, to Coney Island in 1896. Bicycling had become such a popular sport nationwide by the end of the century that cities were hard pressed to control the traffic. Many municipalities passed ordinances regulating bicycle speed, requiring lights at night and horns or bells for safety. In Golden Gate Park bicycles were barred from certain roads in 1886. Some special paths were built for bicyclists, but they protested that they should be allowed the same freedoms on the roads that were extended to riders of horses and carriages. (Raymond Clary, The Making of Golden Gate Park: The Early Years, 1865-1906 p.74-76) I never cease to wonder at how much has changed in our great urban parks since their inception, yet how much remains the same! The following poem, published in the San Francisco Examiner on Dec. 8, 1895, gives a sense of what women bicyclists were up against in the nineteenth century. I am certain I never will love or admire. A girl who goes whizzing about on a bike. Is enough to make any man’s cranium reel. And why did she smile as she lightly spun by? Does she think I could love her? No, never, not I.
Confound it, I really believe I could ride. She has tangled my heart in her mystical whirl. This entry was posted in arts, recreation. Bookmark the permalink. That’s delightful! Thanks for publishing this. It follows nicely on your earlier piece on bicycles in Golden Gate Park.